Fires are terrible disasters that can happen quickly and turn your beautiful property into a pile of burning ash. If your home or business is lucky enough to survive the flames, there is still a lot of work that needs to be done before you can use your building again. That’s where Disaster Relief comes in. We understand how destructive a fire can be, both to your property and your mental and physical well-being. That’s why we go above and beyond to provide professional fire and smoke damage restoration services you can count on. We will clean up your property, repair any structures damaged by soot, smoke, or water, and will write, document, and photograph your contents and structural damage to assist you with your claim. 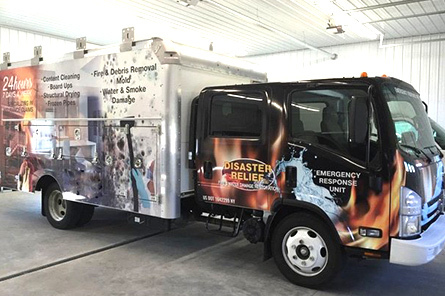 From repairing damaged drywall and removing smoke odor to installing new framing, removing mold, cleaning your soot-covered furniture and more, Disaster Relief truly does it all. If you have been the victim of a fire and need fire damage services, contact us right away. Do not use a vacuum to remove the water. Do not use electrical appliances in water-affected areas. Do not go into affected areas if the electricity is still on. Do not eat food exposed to fire or smoke. Do not attempt to lift tacked-down carpet. Call for professional help right away. Smoke detectors are an excellent tool to reduce loss of life and property damage due to fire. Many homes have smoke detectors installed throughout, but many are nonfunctioning due to dead batteries or old age. Smoke detectors should be tested on a monthly basis, batteries should be replaced every year, and the smoke alarm itself should be replaced after ten years of age. If you do not know the age of the detectors in your home, it’s crucial that you inspect the device for a manufacture date. When it doubt, just replace them. It could save your life. A fire can start anywhere in your home and can spread very rapidly. That’s why it’s so important to install smoke detectors in every room. Current New York State Fire code requires that smoke detectors be installed in every bedroom, outside the bedrooms in the hallways leading to them, and at least one must be installed on each floor of the dwelling. There are various types of smoke detectors on the market today. The most significant difference in overall operation is whether each smoke detector functions independently or whether they are linked. In a linked system when one smoke detector is triggered by a fire, it automatically triggers the rest of the smoke detectors in your home. Here at Disaster Relief, we truly care about your safety. We encourage all our customers to install and check their smoke detection devices regularly. Together we can help preserve life and property damage. © 2019 Disaster Relief. All Rights Reserved.